"It was at the Halloween dance that I got the first glimpse of my past life." Those of you who have read my debut novel Remembrance know that is the first line of the book. And because Halloween is coming up, and because it plays a big part in Remembrance, I've decided to host a giveaway in celebration of the holiday! 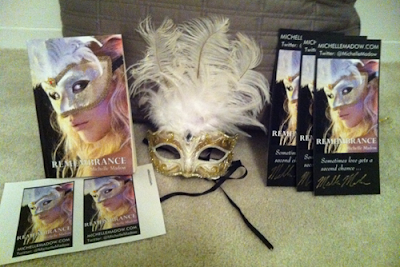 Remember that prize pack I gave away for the Vengeance cover reveal? If not, check the picture below. Because I have another similar prize pack to give away, and the giveaway starts now! The giveaway will run from October 23 to November 2.
ummm yeah *squeeeee* ok sorry I got that out of my system now. What an Awesome prize pack for some lucky person!! whooot! Thanks so much Michelle you are AwesomeSauce girl. Eeeeekkk!!!! Thanks for another chance to win! I was really bummed that I lost last time. Maybe my luck has changed ;) I super siked about this :D Again, thanks for the giveaway! Another awesome giveaway! Thanks so much. I would love to win but I guess I have to what and see. This book and series sound so good. I am looking forward to reading them. Thanks for having this great giveaway. Happy Halloween! OMG I am dying to get my hands on this book! It's killing me because I don't own an E-reader(don't have the funds yet). And I looove that mask, masquerade masks are an obsession of mine. So thanks for the chance to win.